Mary Beth Temple is a crochet designer whose work I've liked for a while. The reason is because she combines classic crochet techniques and stitches into contemporary fashions that are wearable. A lot of her designs are also relatively quick to stitch. Also being plus sized, I appreciate attractive crochet patterns that fit my build. The patterns in this book are American crochet terminology with international crochet notation as illustrations for the stitch patterns. It starts with detailed information about changing the size of the patterns, and adapting them to different yarn types. It explains how to shorten, lengthen and change the fitting of patterns, as well as swatching then testing the swatches for the method you plan to use for laundering or checking how stretching will affect the fabric. Handy if you're like me and generally prefer cotton yarns. Then you get to the patterns, which are all shown on lovely women of different shapes and sizes. This book is heavy on the sweaters, pullovers, cardigans, shells and vests. There are also some outwear and accessory patterns and one gorgeous skirt. The patterns start with suggested yarn types, but also include the Craft Yarn Council of America's sizing for that yarn and the gauge is listed so you can try it with a different yarn easily. They are all written in good detail and easy to follow. I'm better with charts than written instructions so I'll refer to the charts for the stitch pattern and use the instructions to know where to increase and get the right measurements and shapes. The variety of patterns is good. My favorite long sleeves sweater in the book is the pullover on the cover. Her version uses spike stitches as colorwork accents on the yoke and wide sleeves in a nearly floral effect, and it has shaping around the waist to pull it in some and reduce bulk, then flares out to skim over the hips. The yarn weight and look of the sweater make it a great one for fall and winter months. For sleeveless sweaters, the Perfect Base Tank Top is made using a fine yarn in a shell stitch and is nicely fitted. The fine yarn and shaping keep it from being bulky and the shell stitch help keep it from getting boring to make. The Essential Cardigan is a basic cardigan great for all sort of winter and fall layering, and it's my favorite cardigan. Other things I love in this book are the Traditional Cloak, the Sensible Shawl and lacy Wrapt Top. Andee Graves' skirt is just fabulous, a wrap skirt with a beautiful shape made from wool. Good instructions, contemporary designs and the sizing goes from XL to 5X. The designs are handmade boutique in styling. 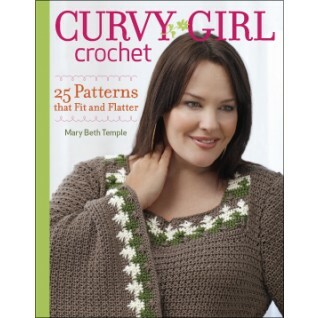 Out of 25 patterns, there are only a few that aren't my style at all, and I believe this book will have designs that will appeal to most women who like fashion crochet with a good fit for larger body types.